If you have not been living under a rock for the past 2 years, you already know that Internet of Things is going big. Everything from your watch and wearables to medical devices to refrigerators to even cars and Industrial devices are connected. And these connected devices are not secure. 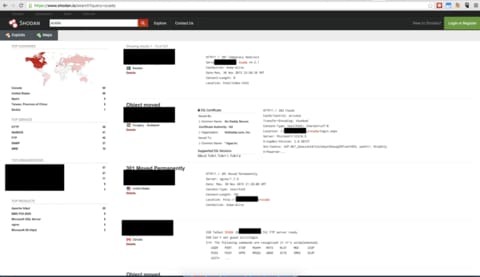 If you don’t believe me, go to shodan.io and type your favorite device and see what happens! You might have yourself played around with a device or two or would be planning to do so in the near future. Our interactions with individuals we’ve met recently in the infosec community (primarily @ 2017’s DefCon and BlackHat), who have not worked on IoT exploitation earlier, is that they find a huge barrier to get started with finding vulnerabilities in the so-called “smart devices”. I am not from an Electronics background, how am I expected to perform Hardware exploitation? I just don’t get all the different technologies and standards used in IoT devices. Where do I even start? All of this looks way more complicated to me and is not something that is required of me at the moment. It is true that IoT security and pentesting is one of the least available yet highly sought after skillset in the present day security industry. Even if your job does not require you to hack into IoT devices, we can assure you that in the next coming months, you will find yourself getting more IoT pentests compared to anything else. 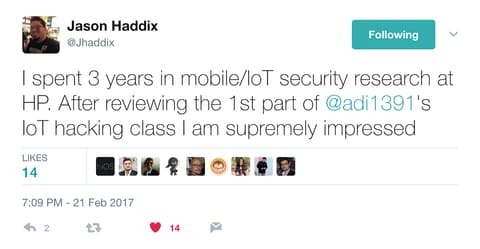 That is why we decided to launch our Offensive IoT Exploitation training class to the public. We have conducted this training over the past 3 years to government, private organizations, Fortune 500s and VC-funded startups, and have gotten amazing results! We figured out that if taught in a methodological way, 5-days is enough for anyone, anyone who has absolutely no prior experience of IoT pentesting, to get started and be ready to perform a real-world IoT pentest. We have even gone ahead and published a 300 page book called the IoT Hackers Handbook, to help people who can’t afford our training get started into IoT exploitation. Obviously you won’t be the best IoT pentester in the world in 5-days, but the biggest point is are you ready to invest 5 days to get yourself started and change everything that follows. But how do you expect to cover everything in just 5 days? Hardware Introduction - standards, interfaces, etc. All through these 5-days, we focus on labs and hands-on, which is one of our core features of the training. It’s just that, we feel that things taught are easily forgotten, but if you do it by yourself during the class, it stays with you for a long long time. You will get additional materials such as the Training VM, Reference guides, cheatsheets, lab materials and so on. Our upcoming training class is from 16th-20th October, 2017 in the center of Silicon Valley - downtown San Francisco. The spaces in these classes are extremely limited, because we want the training to be a private engagement where everyone gets to learn the most, and not a group of 20-30 or 50 people which makes the learning a bit less personal. The training cost for all the 5-days (incl. everything mentioned above) is $3500. There is no early-bird, late-bird or any-bird kind of pricing. It’s a single pricing and lasts only till the seats are available. There are no at-door registrations. You can register online here. If your company still has the training budget, ask them to invest in this training and get a return which you don’t usually get from the other training you attended. If your company has run out of the training budget this year, you can ask them to squeeze in a bit of budget for one or two persons from your team to attend the training. Any further questions? We can be reached through the Contact Us page here or over email (support at attify dot com) for any further information if required.